In this construction video tutorial, you will learn how to work out the quantity of steel in a two way slab. It sheds light on the placing of rebar in two way slab. Besides, one can learn the bar bending schedule process for two way slab reinforcement. If the ration (L/S) remains under 2.0, slab is known as two-way slab. Bending will occur in two directions in a dish-like form. Consequently, main reinforcement should be provided in two directions. The bars which are utilized in Tension zone of the slab are known as Bent up bars. Technically in slab, these bars are called differently as main and distribution bar. Main Reinforcements bars are arranged in the shorter span of the slabs and the distribution bars are provided along the longer span of the slab. In the longer span of the slab, the steel that is provided is called as Distribution steel. It does not bear any types of load and only perform to disperse the load or resist the shrinkage stresses. 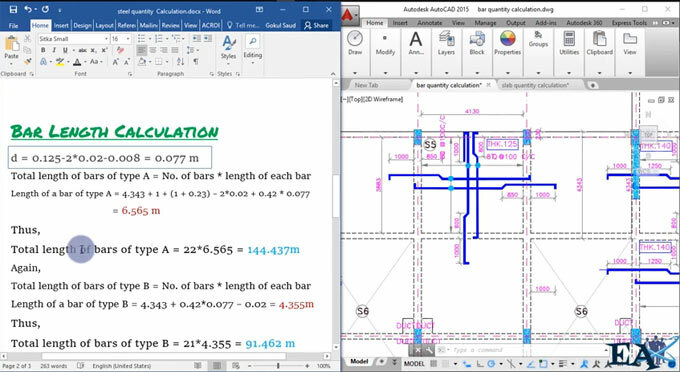 To learn the complete process calculate the steel quantity in a two way slab, go through the following video tutorial.